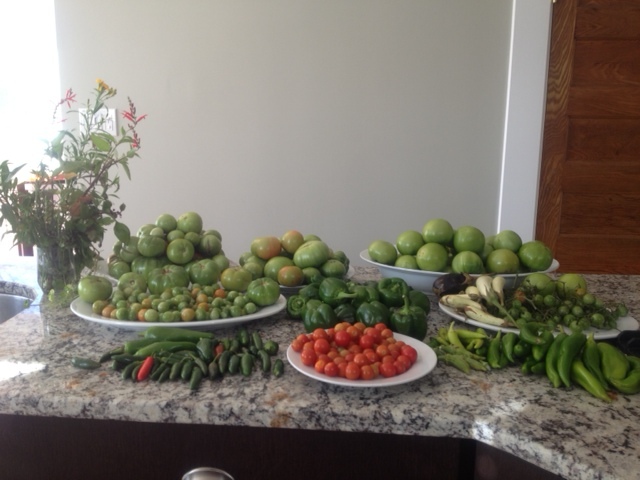 The Last Harvest Before the October 28th Frost | Gardens, Gardens, Gardens! On Friday, with the many warnings of the approaching storm, we rushed out to pick all the vegetables and herbs that are not frost resistant. We got some Basil and Mexican Mint for pesto and all these crops that could be seen in the picture. There was no real snow in our area, but a colder night followed. We got them just in time, and are grateful for the extra warmer days in October. These tomatoes are SO much juicier, and tastier, than one can purchase, even when they are indoors for a few weeks!!! They will last at least through November and December. Only draw back with growing our own…we are reluctant to buy cucumbers and tomatoes in the winter, because they are so tasteless. Thanks for sharing your gardening success and your suggestions of an earlier start next season! Did you plant vegetables this year?